I got a letter today asking to help out with the McCain/Palin campaign. And so I will. Instead of making phone calls one by one, let me lay it out there all at once. The lunch table at work is a strange place these days. Everybody is a political expert, sure about what they know and scornful of any differing opinion. I find it worrisome that but nobody has any memory or knowledge of anything that happened before Disgusting Former President Bill Clinton took office, if they can even go that far back. The Obama-JFK comparisons are killing me. I think its true that there is a great deal of simialrity between the two, thanks in no small part to the unsublte ham-handing of the modern-day Kennedy machine behind BO. I believe that there is a great deal the two have in common, but its not in a good way. Unlike the lunch table experts, I base my opinions on extensive scholarly research, which consists of reading of books speculating about what Jackie was really like and then comparing the details to the TIME magazine archives. So I'm like a historian. A historian of gossip about high-end fashion and tolerating a family culture of epic carousing and debauchery. But, who can blame them, these young things with only sound bites and YouTube to inform them? I was googling today for the exact original context of the phrase "running dogs", and guess what you get? References to exercising with your dog! And no references at all to The Big Chill. Then I tried adding "imperialism" to "running dogs" in the search box and didn't fare much better - I had to go quite a few pages deep to find references that were more than (smarter) bloggers using the phrase in a sardonic way and only then with the vaguest connection to Mao Tse-tung. So, can you really blame people who gush that MO is the new Jackie Kennedy? They both wear dresses! Yes! At least the lunch table experts know that much. Do I smell flop sweat? Gosh, poor old Hill's prospects seem to be sinking, sinking every day. I have to start considering the possibility of switching my fashion observation to another. 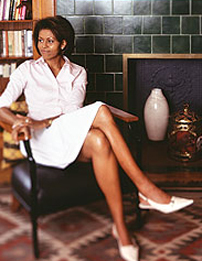 Michelle O has good taste, wears nice clothes well and doesn't seem to be afraid of showing bare arms. Where is the fun in that? Not even the possibility of that mesmerizing underarm flap during a "Bingo!" type wave. 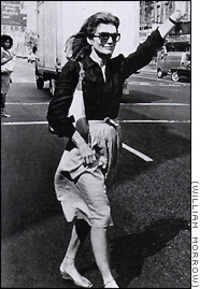 Admit it - no matter what your politics, wouldn't you love to see HRC waving in a sleeveless top? I would. Although MO does have some remarkable feets on her. Would that be enough to carry us through 4 years? Highly doubtful. WAIT - I just got excited thinking about the possibility of a photograph of Michelle O and 6' 3" Austrian Foreign Minister Ursula Plassnik sitting toe to toe. but with no clear-cut favorite, oddsmakers face tough task. *Be sure to visit Princess Sparkle Pony for a glimpse of Formal Ursula. The woman is magnificent.